These are the opening remarks from Pope Francis in his Apostolic Exhortation The Joy of the Gospel. This remarkable and insightful document encourages us to recognise the joy found in accepting and responding to the Gospel message, a joy found through deep encounter with the person of Jesus Christ. The document is practical and pastoral, inviting each of us to reflect upon how we can take up again the spreading of the good news, the joy of our faith, with enthusiasm and vitality. “There are Christians whose lives seem like Lent without Easter. I realize of course that joy is not expressed the same way at all times in life, especially at moments of great difficulty. Joy adapts and changes, but it always endures, even as a flicker of light born of our personal certainty that, when everything is said and done, we are infinitely loved. I understand the grief of people who have to endure great suffering, yet slowly but surely we all have to let the joy of faith slowly revive as a quiet yet firm trust, even amid the greatest distress: “My soul is bereft of peace; I have forgotten what happiness is… But this I call to mind, and therefore I have hope: the steadfast love of the Lord never ceases, his mercies never come to an end; they are new every morning. Great is your faithfulness… It is good that one should wait quietly for the salvation of the Lord” (Lam 3:17, 21-23, 26). As we enter 2014 we are invited to reflect upon both the suffering of our world and the deep intrinsic joy that can come through encountering Jesus through the gospels. The full text of the document can be found on the Vatican website here. Fr. Elio Capra who visited our Diocese in 2013 will be presenting a workshop on Friday 14 March at Picton Parish. Everyone is most welcome to attend. Have you ever heard this phrase: "I was born in 1981, so whether I am a ‘young person’ or not probably depends on your perspective. I am however passionate about youth ministry and believe that we as Church need to give our young people the best opportunity to develop their gifts and talents so they are empowered in their relationship with Jesus and their faith does not wither and fade." The good news is that this is exactly what our Diocesan Vision for Catholic Youth Ministry says our goals are. Our Diocesan vision is based on the National Vision ‘Anointed and Sent’, available here. 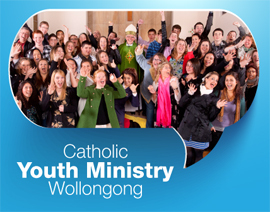 Bishop Peter has called for a consultation process into Catholic Youth Ministry throughout our Diocese to identify strengths and needs, and to consider how we can be more active in our ministry with young people. 2. Come along to Focus, Fellowship and Fish & Chips - An evening of food, music and brain-storming ideas for youth ministry. This evening is particularly aimed at post school-aged youth, but all are welcome. 3. Join Bishop Peter Ingham and over 100 young people at our Youth Ministry Planning Day to create an action plan for youth ministry in the Diocese. As we enter into this time of consultation, as a "semi-youthful person" I believe we can use this process as a reminder of the value and worth of young people. As a faith community we can help young people realize their self worth and the love God has for them through many avenues: prayer, experiences of welcome and inclusion in faith communities, giving opportunities for young people to contribute, and inviting them into a relationship with Jesus through Church. As we seek to live out our baptismal call as disciples of Jesus, let’s spend some time in the coming weeks acknowledging what young people (and advocates of the young) are doing RIGHT. 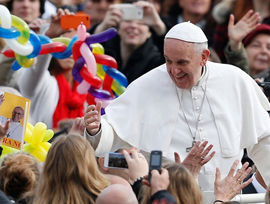 Let’s be encouraged by Pope Francis’ words to be lights of hope for young people. May this consultation time be a time of celebration and truly moving forward in Catholic Youth Ministry with Jesus. CatholicCare's Marriage and Relationship Education programs prepare couples’ relationship for the future years ahead. The program provides an opportunity to make a start on building a more rewarding life together. 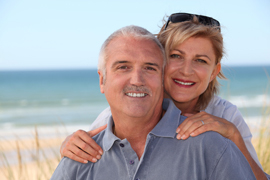 CatholicCare provides two programs for couples preparing for marriage. Both cover such topics as expectations of marriage, family of origin, communication, managing conflict, spirituality, sexuality and intimacy. Partnership: In a groupwork setting, couples explore what they want out of their relationship, build on strengths and gain awareness of some potential problem areas. Prepare: Helps couples on a one to one basis prepare for marriage and work through issues before marriage. 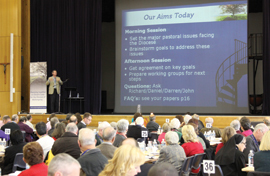 Bishop Peter and the Diocesan Pastoral Council invite Clergy, Parish Pastoral Councils, parishioners and other interested people to gather and participate in the continued development of Parishes Working Together and the Diocesan Pastoral Plan. Please contact Darren McDowell 4222 2463 or darren.mcdowell@dow.org.au for further information. Registration is essential for catering purposes and so I invite you to contact Helen Bennett via email helen.bennett@dow.org.au by Wednesday, 26 February 2014 to book your place. 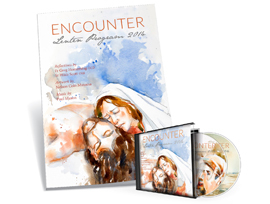 Lent is just three weeks away but it's not too late to order your copies of ENCOUNTER: Lenten Program 2014, a 44 page weekly program designed as a six-week Lenten resource. In most cases we are processing orders same day so you will receive your order within a day or two of ordering. By unpacking the Sunday Gospels during Lent, Discalced Carmelite Friar, Fr Greg Homeming OCD, looks at how we see and encounter Jesus Christ in our own lives. Fr Greg is a popular conference, spirituality and retreat speaker in Australia and overseas. Fr Greg’s teaching is beautifully complimented by Sr Hilda Scott OSB's (Vocations Director, Jamberoo Abbey) Spiritual Direction and Guided Meditation. Sr Hilda has a wonderful way of showing us God in the every day. ENCOUNTER also includes thought provoking reflection questions perfect for group discussion as well as a sung Responsorial Psalm (see Triple CD below) and opening and closing prayer for each week. An accompanying Triple CD Resource is available for purchase for $8.00 ordownload for free at www.lent.dow.org.au. The CD Resource contains a weekly Responsorial Psalm composed by Paul Mason and performed by nationally acclaimed soloist, Louise Symes. The CD Resource also contains audio versions of the Gospels and Gospel Reflections by Fr Greg, Spiritual Direction by Sr Hilda as well as (for the first time) Guided Meditation led by Sr Hilda (N.B. The Guided Meditation is only available on the Triple CD or MP3 download). The whole is contained within the beautiful artwork of Nelson Colo Matoma who has painted six new watercolour expressionism artworks for the program. As always, the cost of the program has been kept as low as possible (from $4.40) to ensure the resource can be made widely available to local communities. If cost is still a factor prohibiting you from distributing widely in your community, please contact Jenny Rapoiso on the number or email below. POSTAGE AND HANDLING: 1-10 items ($7.00); 11-25 items ($13.00); 26-50 items ($17.00); 51-100 items ($20.00); Over 100 items (or international orders) contact us before placing order to confirm postage and handling. If you live outside the Diocese of Wollongong and would like to orderENCOUNTER, download an order form below and email/mail/fax back to us or contact Jenny Raposio directly at +61 2 4222 2411 or orders@dow.org.au. If you live outside Australia and would like to order ENCOUNTER , please contact Jenny before filling out the order form so that we can advise you of the shipping costs. You can download a sample of the program and all the audio at www.lent.dow.org.au. However, if you would like a full sample hard copy of the program for evaluation purposes, please contact Jenny on the number or email above. Have you heard The Journey - Catholic Radio Show yet? 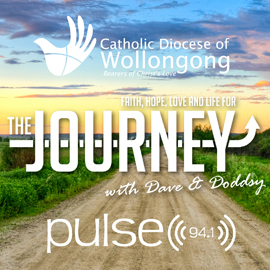 The Journey is a weekly program produced by the Diocese of Wollongong. This week features an in-depth interview with Bruce Downes, The Catholic Guy, as well as all the regular weekly spots including our Sunday Gospel Reflection, Sr Hilda’s wisdom from Jamberoo Abbey, and great tips for living well from Trish McCarthy, Pete Gilmore and Fran and Byron Pirola on marriages. Listen in on Sundays from 11am-12pm and repeated on Wednesdays from 10pm-11pm on PULSE 94.1FM in the Illawarra and South Coast. You can also live stream the show at www.pulse941.com.au or listen to past shows any time at the diocesan website at www.radio.dow.org.au. The show explores the many "good news" stories about what those in the Church are doing all around the Diocese. Worldwide Marriage Encounter (WWME) is a Marriage Enrichment experience for married couples, set in peaceful surroundings, away from the distractions of everyday life. During the weekend, couples have the opportunity to reconnect, rekindle and refresh their relationship. Take time out and invest in your most precious asset - YOUR MARRIAGE! On Sunday 16th February, WWME will celebrate 40 years in Australia. Mass will be celebrated by Bishop Peter Ingham and Fr Shane Kelleher at 10am at Mt Carmel Parish, Varroville, followed by a day of fellowship with the Marriage Encounter Community.